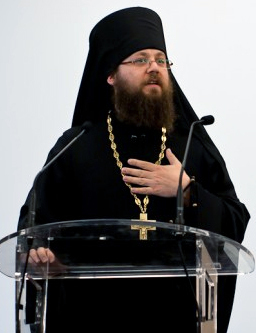 ARCHIMANDRITE IRENEI is the Dean and Director of Studies at Sts. Cyril & Athanasius Orthodox Institute. He is responsible for its development and foundation as well as its academic program. He is also the core lecturer in patristics and Church history. Father Irenei is an established scholar of patristics and the early Church, and an Archimandrite of the Russian Orthodox Church. Formerly a don in patristics and early Church history at the University of Oxford and sometime Chair of Theology at Leeds Trinity University College in the United Kingdom, he is an active speaker and lecturer around the world on Orthodox theology and practice, and has also been heavily involved in bringing patristic study into wider access through the internet. He is currently visiting professor in Orthodox theology at Santa Clara University, Professorial Research Fellow of Leeds Trinity (UK), and the Superintendent of the St John of San Francisco Orthodox Academy - North America's only fully-accredited Orthodox K-12 college preparatory school. Professor Fr. Irenei’s scholarly work centres on patristic theology, especially anthropology (doctrines of the human person) in the Orthodox patristic tradition—specifically of the early period (ad 33-451)—and its relationship to soteriology in a Christological and Trinitarian context. His work is marked out by a strong emphasis on historical development (especially Eastern) and its relationship to modern theological discussions. He has authored numerous books and published extensively on patristic and Orthodox topics (many of his works were published before his monastic tonsure and are found under his old name: Revd Prof. M.C. Steenberg). He is widely known beyond academic circles through his work to bring Orthodox patristic and monastic study to a wider audience. He founded the Monachos.net web site on Orthodoxy through patristic and monastic study in 1999, which is today the largest resource for such materials on the internet. The website’s message forum, known as the Discussion Community, is one of the only forums on the internet dedicated to patristic and monastic discussions. In 2008 he began weekly internet radio broadcasts for Ancient Faith Radio, in a series called A Word From the Holy Fathers. These broadcasts, which focus each week on a patristic writing and its pastoral impact, are among the most listened-to podcasts on the station. Fr Irenei served as deacon of the Russian Orthodox Parish of St. Nicholas the Wonderworker in Oxford from 2007-2010, and in January 2010 moved to San Francisco. He was ordained hieromonk in March 2010 and elevated to the rank of Archimandrite in 2011.